We design and make embossing stamps for leather! We also make lots of tags and labels! MONDAY TO THURSDAY 9am to 5pm! PLEASE NOTE THAT DUE TO EXCEPTIONAL DEMAND WE MAY NOT BE ABLE TO RESPOND TO NEW ENQUIRIES FOR A FEW DAYS. Sorry about this, but we are working flat out to keep the delay as short as possible! Follow Artisans's board Artisans recent jobs on Pinterest. Before buying your stamp, it is wise to test your leather first. Click here to find out more. After two years of development work in association with one of the UK's most respected leather craftsmen, we have perfected our ability to design and make extremely fine yet durable embossing stamps. 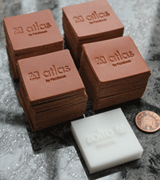 Whether you use a 20 ton hydraulic press or a hand held mallet, our stamps will create the right impression for your crafted products. We've taken fine detail to the outer limits and hammered them into oblivion, so we know what can and can't be achieved!! Ray Hatley at Barefoot Leather says "Artisans stamps have revolutionized the way I work. In the past I would have had to commission a custom stamp and have it engraved at huge expense - then wait weeks for it to be made". The process couldn't be simpler- just email us your design - or provide a written brief and image references if possible - and we create the stamp artwork for you. Next we email this to you and once approved we quickly make the stamp, cutting the whole process down to a matter of days and at a fraction of the price you'd pay for metal tools! Please note that all our work is bespoke and therefore we require advance payment in full before we do the work. Here on the right is a photo of our 3 'standard' stamp shapes, which if you use a mallet instead of a press will really make a huge difference to what you can produce. 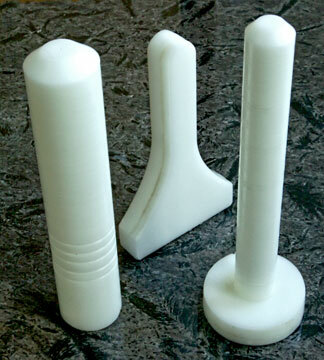 We can make acetal or brass mallet stamps to any shape and any practical size and will advise you on what works and what doesn't.